Department of Science & Technology, and in accordance with ISO / IEC 17025. 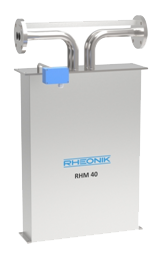 ROCKWIN is exclusive distributor in India for Rheonik Messtechnik GmbH, Germany for Coriolis Mass Flowmeter, These flow meters make use of Coriolis force principle for measurement of mass flow of liquids and gases. Its unique omega tube element and cross bar / torsion bar construction enables its high degree of accuracy remaining unaffected by pipeline vibrations and pressure changes. A range of Electronic readout units for panel and field mountings are available. Applications include Petroleum products, Pharmaceuticals, LPG, LNG, CNG, Food and beverages, Pulp etc.